Quality Limited Edition Prints on heavy acid free stock. Each numbered and signed by the artist. 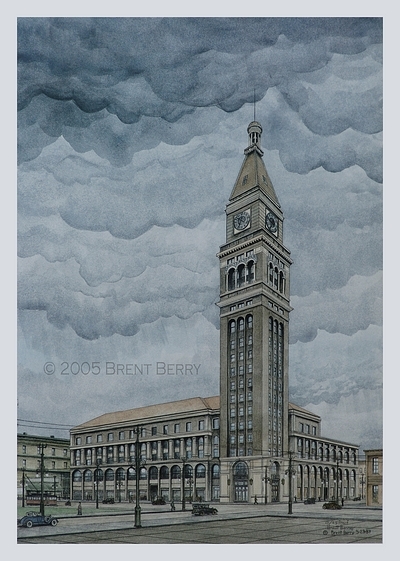 These historic and nostalgic Denver prints make a great gift for anyone who loves Denver. This little jewel is located at 1441 Larimer Street in Denver's Larimer Square. It was built in 1875 and was designed in the style of Second Empire French. The pillars and trim are made of metal. It's probably the most ornate building of its size in Denver. Signed limited edition Prints in a series of 1000. Size 7" X 10" $25. + FREE SHIPPING! 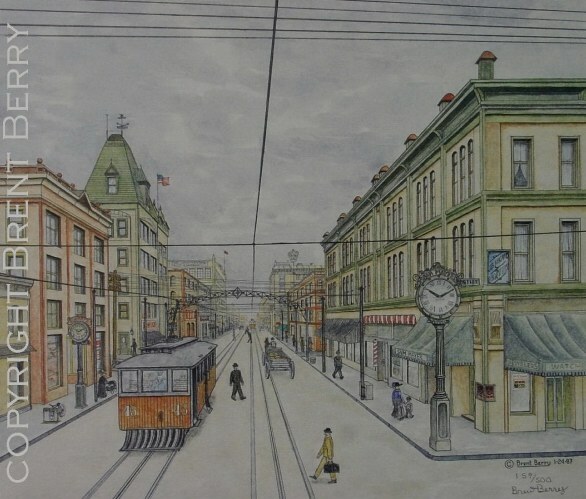 A Denver Street Scene (1900 era) 16th & Champa, the original was done in pencil and watercolor. A view of downtown Denver looking Northwest on 16th St. from the corner of Champa. In a limited edition of 500 prints on quality heavy acid free stock. Hand signed and numbered. The image is 13 1/2" X 12" with a very wide border that could be framed as is or cut and matted. Once the home of Denver's most mysterious Bordello. 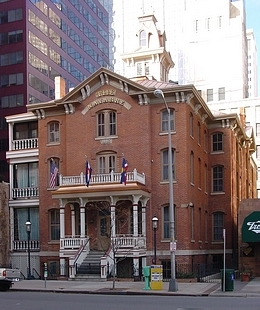 The Navarre was built in 1880 as the Brinker Collegiate Institute but later became the Richelieu Hotel and then in 1904 it was remodeled and reopened as the Navarre, a restaurant with gambling and hookers. It is located at 1727 Tremont Street, across from the famous Brown Palace. There was an underground tunnel with rail tracks that went from the Brown Palace to the Navarre so that businessmen could visit the ladies without being seen entering the building! A sealed up entrance with rail tracks has been found in the basement of the Navarre and there have been 100's of references to the tunnel and its use over the years. This print represents the Navarre as it was around the turn of the century (1904). It has been the home of several businesses over the years including the Museum of Western Art. The original was pencil and watercolor. Printed in an edition of 1000. A photo of the Navarre as it looks today. 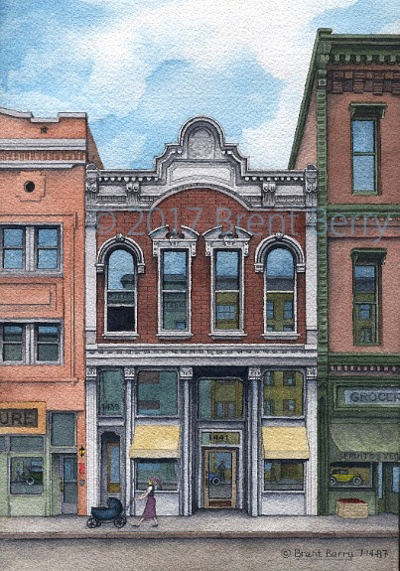 The original of this Denver landmark was done in pencil and watercolor. Printed on heavy acid free stock. Signed and numbered in a series of 1000. This building was completed in 1911 and opened for business as Daniels and Fisher Department Store in 1912. Its on the North-East corner of 16th street and Arapahoe in downtown Denver. Its design was inspired by the tower of Campanile in Venice. The D & F Tower was the tallest building in Denver at the time and Buffalo Bill complained that it blocked the view of the mountains. It has always been a landmark known to all who have lived or visited Denver. Over the years the building was owned by several people and was purchased by the May company, then becoming the May D & F store. In 1958 May D & F moved to a new location and the building then became the Tower Merchandise Mart but in 1965 was closed and in 1971 the main part of the building was demolished. In 1980 when the tower was being restored, an urn containing the ashes of W.C. Daniels was discovered hidden inside one of the walls, his wish I'm sure! The lonely tower still stands proud today and has been declared an historic landmark and still serves as a home to several businesses. The image is 20 5/8" X 14 3/8" with a 1" border, Total size is 22 5/8" X 16 3/8"
A small 1930's night scene. Signed LTD edition prints in a series of 1000 prints. 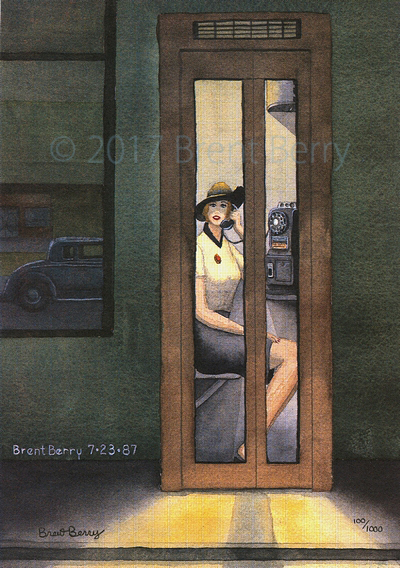 This piece simply reflects my love for the 1930's but she is definately a Denver girl!!! Printed on quality heavy acid free stock. 7 1/4" X 10"
GET ALL 5 DENVER ART PRINTS FOR $100. SAVE $40. + FREE SHIPPING!